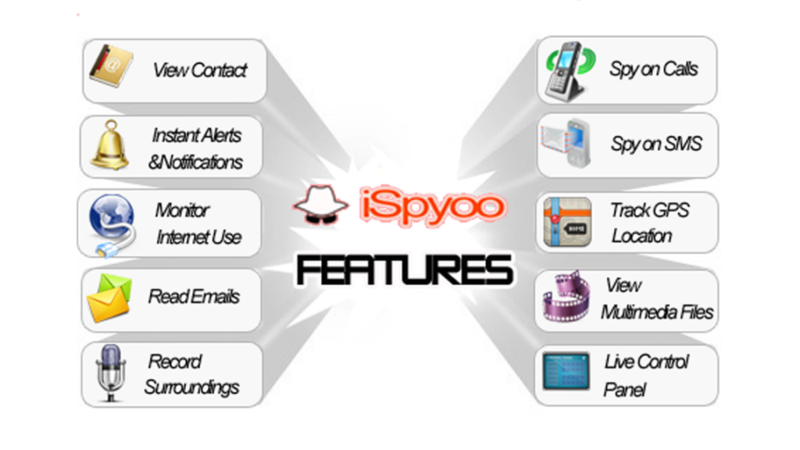 iSpyoo Mobile Spy App offers a whole arsenal of powerful monitoring features. Ciúin monatóireacht a dtimpeallacht teileafóin, teachtaireachtaí téacs, Suíomhanna GPS, sonraí glao, grianghraif, gníomhaíocht meáin shóisialta and more. This page will take you through a list of our innovative features and this is where you can learn all about how each feature can work for you. Scroll through the page to learn more about all that iSpyoo Tá a thairiscint. Is féidir leat taitneamh a bhaint go léir na gnéithe mór i bpacáiste mór amháin. Féachaint ar na hainmneacha agus na huimhreacha atá stóráilte sa leabhar seoltaí. Féach mionsonraí eile, cosúil le seoltaí, ríomhphoist, poist ghairmiúla, srl. Mar thuismitheoir tá imní ort faoi a bhfuil do leanbh i dteagmháil léi fón póca tú. B'fhéidir a fhios agat faoi leanbh eile nach bhfuil tú ag iarraidh do leanbh chun teagmháil a dhéanamh. Nó d'fhéadfadh a bheith ann duine éigin go bhfuil sí i dteagmháil is strainséir a thabhairt duit. You need to know who your child is contacting in order to protect them. iSpyoo records all contacts that are saved on the mobile phone. Féach ar na huimhreacha agus na hainmneacha atá stóráilte sa leabhar gutháin. Téigh tríd na hiontrálacha Fón-Eolaire ar an sprioc teileafóin. Féach sonraí teagmhála eile a bhí shábháil mar seoltaí ar nós, IDs ríomhphoist agus breithlaethanta. Féach ar gach na n-iontrálacha laistigh Tasc Logáil gan dul tríd an teileafón féin. Féach ar aon chruinniú sceidealta nó tasc ar feitheamh. Rochtain na sonraí eolais le haghaidh gach iontráil, Lena n-áirítear tosaíocht, dáta dlite, agus aon nótaí seo a leanas. Tá an fhaisnéis go léir Tasc Logáil uaslódáil ar do líne iSpyoo painéal rialú gur féidir leat rochtain a trí logáil isteach ag am ar bith, ó áit ar bith a bhfuil nasc idirlín. Féach ar na sonraí ar glaonna saor in aisce a rinneadh trí Viber. Monatóireacht a dhéanamh ar théacsanna agus grianghraif sheoladh agus a fuarthas. Rochtain sonraí seo ó aon ríomhaire Idirlíon-chumasaithe. Rochtain ar an eolas ó do Painéal Rialúcháin. Féach ar gach comhrá iMessage. Féach ar na hainmneacha IM agus uimhreacha na ndaoine sna comhráite iMessage. Faigh am agus an dáta stampaí go mbeadh a fhios nuair a thóg gach comhrá ar siúl. Faigh rochtain ar aon grianghraif, físeáin nó comhaid fuaime a sheoladh trí iMessages agus a shábháil ar an sprioc teileafóin. Tá gach iMessage faisnéis rianú uaslódáil chuig do líne iSpyoo control panel which you can be accessed from anywhere with an internet connection, tráth ar bith. Féach ar gach comhrá comhrá Skype. Féach ar logaí glao Skype iomlán. Faigh amach an ainmneacha agus uimhreacha na ndaoine siad a bheith ag comhrá le agus ag glaoch. Faigh am agus an dáta stampaí go mbeadh a fhios nuair a ghlac gach comhrá a dhéanamh nó glaoch áit. Faigh rochtain ar aon grianghraif, físeáin nó comhaid fuaime sheoladh trí Skype agus a shábháil ar an sprioc teileafóin. Gach comhrá Skype comhrá agus logaí glao a uaslódáil chuig do líne iSpyoo painéal rialú ar féidir leat rochtain ó áit ar bith a bhfuil nasc idirlín. Teacht ar an eolas go díreach ó do Painéal Rialúcháin. Féach ar gach URL go bhfuil a bhfuil cuairt á tabhairt. Amharc tríd na láithreáin ghréasáin go bhfuil an t-úsáideoir sprioc ar tugadh cuairt. Gach URL láithreán gréasáin cuairt á tabhairt a uaslódáil chuig do líne iSpyoo painéal rialú ar féidir leat rochtain ó áit ar bith a bhfuil nasc idirlín. Faigh am agus an dáta stampaí ionas gur féidir leat a fhios nuair a bhí cuairt ar gach suíomh gréasáin. Faigh amach an líon uaireanta an t-úsáideoir sprice cuairt ar gach suíomh gréasáin. Féach ar a láithreáin ghréasáin a bhí bookmarked. Féach ar nuair a bhí rochtain ar gach suíomh gréasáin is fearr leat. An fhaisnéis seo anailís a dhéanamh go díreach ó do Painéal Rialúcháin. Úsáid do na fostaithe teileafóin phóca cuideachta a sheoladh agus r-phoist a fháil. An bhfuil siad a sheoladh chomh maith agus a fháil r-phoist pearsanta leis an fón póca? Cad mar gheall ar sheoladh rúin cuideachta a iomaitheoirí? Ní mór duit iSpyoo to keep tabs on your employees’ Gníomhaíocht ríomhphoist fón póca. Is féidir le do leanbh a bhaint as an app ríomhphost fón póca a chur ar bun cuntais ag gréasáin meáin shóisialta. B'fhéidir nach bhfuil tú ag iarraidh do leanbh a chur ar bun le cuntas nach bhfuil a fhios agat faoi. iSpyoo will help you learn the truth about what emails they are sending and receiving. Gach ríomhphost a uaslódáil chuig do líne iSpyoo painéal rialú ar féidir leat rochtain ó áit ar bith a bhfuil nasc idirlín. Féach ar r-phoist a mhalartaítear trí iarratais r-phost tóir. Léigh gach ríomhphost isteach agus amach ar an sprioc teileafóin. Léigh an ábhar gach r-phost. Faigh sonraí seoladh ríomhphoist ar gach senders agus faighteoirí. Féach ar an am agus an dáta stampaí a fháil amach nuair a cuireadh gach r-phost. Bug aon chineál na timpeallachta. Bainistiú a dhéanamh ar an bugging agus rochtain a fháil ar an taifeadadh trí do Painéal Rialúcháin. D'fhonn a fháil fiú níos mó i-eolas domhain ar ghníomhaíochtaí do pháiste, Is féidir le clips fuaime rúnda na dtimpeallacht an fhóin a thaifeadadh as an Painéal Rialúcháin Beo. Is féidir leat a shonrú ar líon na miontuairiscí gur mian leat an gearrthóg fuaime a bheith sula sheolann tú an t-ordú. Ansin na taifeadtaí a uaslódáil go tapa ar an bpainéal chun tú a imirt aon uair a bhfuil tú réidh. Beidh Éisteacht le thimpeallacht do pháiste cé go bhfuil siad ar shiúl cabhrú leat a choimeád slán iad. Beidh tú ag éisteacht má tá sé ag dul amach ar láimh, agus tá an fhianaise gníomh a ghlacadh nuair is gá. Ní bheidh an fón sprioc a fhios go bhfuil tú ag éisteacht i.
Seol ordú simplí SMS leis an sprioc teileafóin nó bain úsáid as an líne iSpyoo remote control to activate the Live Call Intercept feature. Éist in ar aon ghlaoch leanúnach a bheith déanta nó ón sprioc teileafóin. Tar éis gníomhachtaithe, Is féidir leat éisteacht i do na glaonna ag baint úsáide as aon fón. Ní mór duit ach a dhiailiú glaoch chun uimhir an sprioc fhóin agus beidh tú a bheith ag baint. Láithreach a fheiceáil taifeadadh glaonna isteach nó ag dul as oifig. Socraigh suas le roinnt réamhshainithe mian leat glaonna chuig nó ó thaifeadadh. Cé mhéad ama a dhéanann do pháiste nó a dhéanamh a chaitheamh fostaithe glaonna teileafóin le do ghuthán póca? Cé go bhfuil siad ag glaoch agus nuair? Le iSpyoo Smartphone Monitoring Software you can monitor their phone call information. Faigh amach cé a thugann siad, nuair a ghlaonn siad, agus cé mhéid ama a chaitheann siad ar gach glao. Is féidir leat teachtaireacht a sheoladh chuig aon uimhir theileafóin is mian leat lena n-áirítear aon uimhir sa sprioc fhóin teagmhálacha liosta. Níl ort ach cineál i teachtaireacht SMS isteach i do iSpyoo control panel and send an SMS to any number through the target phone. Beidh an teachtaireacht SMS dul tríd an sprioc teileafóin a fhágann go mbeidh an faighteoir a cheapann go bhfuil an SMS faighte ón sprioc teileafóin. An fhaisnéis seo rochtain díreach ó do Painéal Rialúcháin. Láithreach a fheiceáil ar an cá reatha ar léarscáil cuimsitheach. Seiceáil an stair bealach mionsonraithe laistigh de thréimhse shonraithe ama. Sainaithin an suíomh fiú nuair nach bhfuil GPS ar fáil. Cuir i Soláthraíonn do chuideachta fóin phóca a do chuid fostaithe sa réimse. Cén chaoi a fhios agat má tá siad ag taisteal chun a gcuid spriocanna a shanntar? Nó a shamhlú insíonn do pháiste duit siad ag tabhairt cuairte cara teach a cheadú tú ach ina ionad sin téann áit éigin a dúirt tú leo gan dul. Le iSpyoo Smartphone Monitoring Software you will know exactly where your employees or children are when they are away. Folúntais GPS a uaslódáil ag eatramh ama a roghnaíonn tú le nasc chuig léarscáil. Ba mhaith Déagóirí a bheith fionnuar agus ghlac a gcomhghleacaithe agus a bhfuil tionchar mór ag faisin agus áilleacht tionscal an lae inniu. Dealraíonn sé go bhfuil siad faoi bhrú níos mó ná riamh a bhrú ar an gclúdach nuair a thagann sé chun an bealach gúna siad agus gníomhú. Smartphones anois a thabhairt dóibh an deis a ghlacadh grianghraif cur isteach agus iad a phost chuig láithreáin ar nós Facebook, Twitter agus MySpace. Cheapann siad go bhfuil siad díreach ag spraoi agus impressing duine ar bhealach príobháideach, ach i ndáiríre is féidir na grianghraif a a úsáid ina gcoinne agus tá a lán de na daoine amuigh ansin creepy go bhfuil cuma do na cineálacha grianghraif phost. Úsáid iSpyoo to learn the truth about what photos and videos are being taken with your child’s cell phone. Féach ar na grianghraif mar sleamhnán nó mar mionsamhlacha tríd an iSpyoo control panel. Grianghraif a íoslódáil chuig do ríomhaire. Féachaint ar na grianghraif a stóráil ar an sprioc teileafóin. Féach ar am agus an dáta stampaí a fheiceáil nuair a tógadh nó a íoslódáil na grianghraif. Gach grianghraf a uaslódáil chuig do líne iSpyoo painéal rialú ar féidir leat rochtain ó áit ar bith a bhfuil nasc idirlín. Féach ar na físeáin íoslódáil chuig an gléas sprioc. Féach ar nuair tógadh iad.